Aadhar Card Correction Online Without Mobile Number: there are chances that you may need any type of correction in your Aadhar as your details may tend to change with the passage of time like your address or there are chances that due to human error some details in your Aadhar card entered wrong during registration. After you get your Aadhar card made there may be certain corrections that you want to make like the correction in your name, DOB, gender, address, mobile number. Nowadays except for address change for all other corrections you have to reach out to your nearest permanent Aadhar center for the required correction. You can use the official UIDAI website to locate your nearest Aadhar center and you can reach up to there to make the corrections. But for address change, you can do that online so just check out this how to do Aadhar card correction online with a mobile number. 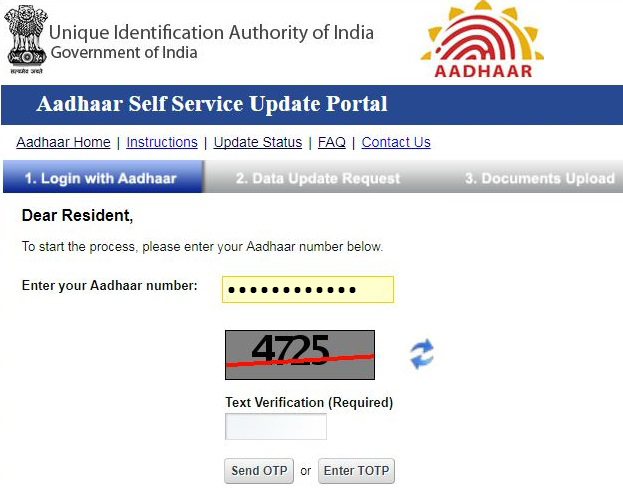 Visit UIDAI and then go to Aadhar self-service update portal which you will find in the dropdown of the left side. If you have a valid address proof click on update address else request for address validation letter. In the next window enter your 12 digit Aadhar number and the verification code the captcha code and then click on sent OTP button. You will receive an OTP on your registered mobile number that is linked with your Aadhar card so just check your inbox for the OTP you received and enter the OTP in the space provided. Tick the address option and click on submit button enter your residential address in the proof of address and click on the submit update request button, in case you want to modify your address click the modify option tick the declaration and click on the proceed button. You need to upload a document in support of POA so just tick a document upload and click on the submit button, click on yes button and select the BPO service provider that will verify your details and your document as per the submission and then click on submit button. The BPO service provider will cross-examine all the details that you have submitted and match them with your record and forward your request to UIDAI for onward processing and updating. Your update request will then be accepted and processed accordingly and an acknowledgment slip will be provided to you giving the details of all your requirement the details of request you made online.